Twilio Programmable Wireless offers a new SIM which gives access to the T-Mobile Narrowband network. Narrowband technology is designed to support Massive Internet of Things (IoT) use cases (typically low bandwidth). Early Access Demo was shown to SIGNAL 2018 Attendees and Trusted Partners. The Developer Board provided with the Alfa Developer Kit is based on the STM32F405RG Arduino MCU series with a Narrowband U-Blox Sara-N410 cellular module. The Alfa Developer Kit ( distributed to SIGNAL 2018 attendees) includes a set of Grove sensors – humidity, light, and ultrasonic. Alfa Developer Kits were distributed to SIGNAL 2018 conference attendees in San Francisco, CA on October 17th & 18th. Breakout SDK enables developers to exchange data between low-powered devices and their services running in the cloud. It intends to do this in the most resource-efficient manner possible. The first build target for the Breakout SDK is the U-Blox Sara-N410 cellular module running on the Twilio Alfa Narrowband Developer Kit. It supports the U.S. T-Mobile Narrowband network. In the future, Breakout will provide expanded device support across different cellular technologies. * During the Narrowband Pilot, a simple HTTP bridge is facilitated via the Commands API. ** During the Narrowband pilot, we are ‘approximating’ NIDD using UDP over IP. The API experience is unlikely to change in the future, but you should achieve much greater energy and network efficiency before the product and developer kit reach general availability. You can follow the getting started guide (README.md) to install in a few minutes the Breakout SDK onto your Arduino IDE. Then you can start sending and receiving Commands from the device. Don't forget to join the Gitter channel for help, or email help-wireless@twilio.com. If you need help installing the Arduino IDE and other requirements to use the Breakout SDK, take a look at the file IDESET.md in the Twilio Breakout Arduino Library repository in Github. See Twilio Breakout SDK for Arduino (Github) for additional documentation. Always is ip when using the Breakout SDK. Currently, the Commands API will automatically choose whether to deliver via IP (polling) for Narrowband devices or SMS for non-Narrowband devices. However, during the Narrowband Pilot, no dual-mode capable devices are provided. Polling checks the server for new Commands (updates) at predefined intervals which are no less than 60 seconds. Why do we poll for Commands? In the non-Narrowband world, Commands are pushed to the device over SMS. However, in the Narrowband world (currently), the device must ask the server if any Commands are waiting. This is because the server does not tell the device that Commands are available. In other words, polling is used because the server does not send any Commands directly to the device. The device must ask the server if any Commands are available to be sent to the device. The Alfa Developer Kit’s purpose is to inspire and equip developers with the necessary tools to create products using the next generation of cellular technologies for IoT. You can get up and running quickly by following the instructions in the Twilio Alfa Developer Kit quickstart guide. Of course, Hello World. You can use this example to learn how to send and receive commands. Temperature/Humidity - sends temperature and humidity information every 10 minutes. Narrowband SIMs were given to SIGNAL 2018 attendees and, currently, this is the only mechanisms for SIM sourcing. After the Pilot, Narrowband SIM orders may be placed from the Console. Received an Alfa Developer Kit with a Narrowband SIM? Register the SIM to your Twilio account by following the normal Starter SIM registration process. If you need help, see I've got a Starter SIM for general instructions. Narrowband SIMs require a specific Rate Plan. A Narrowband Rate Plan is created when you register a Narrowband SIM. During the Pilot, as the only available Narrowband pricing plan is the Developer Plan, this plan will be automatically added to your new Narrowband Rate Plan. During the Narrowband Pilot, devices authenticate to the Breakout cloud service using Pre-Shared Keys (PSKs) over Datagram Transport Layer Security (DTLS). PSKs can be obtained on the Breakout SDK tab of a SIM resource for any T-Mobile Narrowband SIM in the Programmable Wireless Console. The Narrowband SIM PSK needs to be copied into your application code. In the future, Narrowband SIMs will come preloaded with the necessary tools for device identity and authentication (see Trust Onboard). User plane IP connectivity from the device through the packet gateway across the Internet to Twilio's servers. This is likely to change throughout the Pilot. As such, it's important to always be running the most up-to-date version of the Breakout SDK. Twilio Narrowband SIMs support the same set of SIM Statuses as the non-Narrowband SIMs. However, the Narrowband Developer Plan does not support the ready state, but remember, Narrowband SIMs have a specific Rate Plan. See the next section. During the Pilot, only the Narrowband Developer Plan is supported. The Developer Plan is $2 per month and includes 2MB of data per month. Overages are billed at 50¢ per MB, metered and billing in 100KB increments. The Developer Plan is designed to support 60 connections per hour. Production Plans (to be released) are designed to support 10 connections per hour. 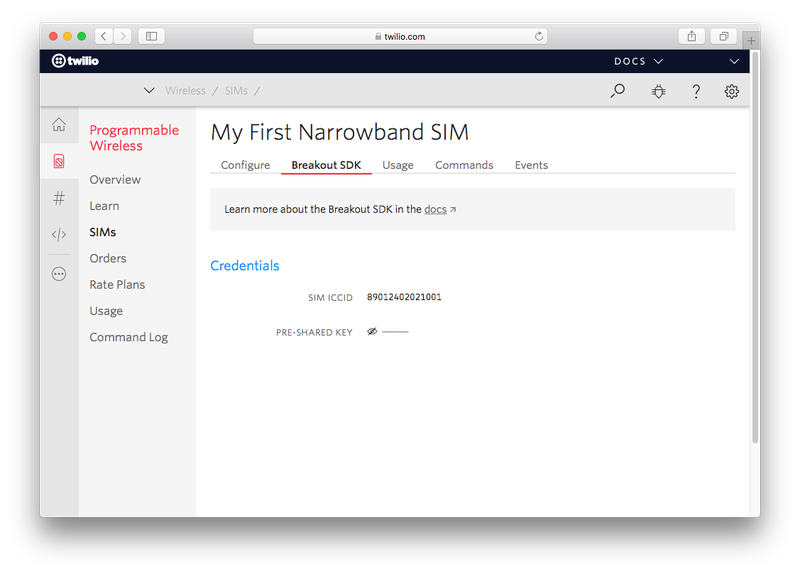 Heartbeats are registered with Breakout service and visible under the Breakout SDK tab of your Narrowband SIM Resource in Console. Heartbeats are displayed in reverse chronological order. You will see the version of Breakout that your Developer Board is running and the date and time the Heartbeat was sent. Narrowband is optimized for low bandwidth devices that transmit data infrequently, aka "Massive IoT" devices. Packets over 3000 bytes will count as three connections. A Command is sent or received from the device with no receipt requested. This counts as 1 connection. A Command is received from the server with a receipt requested. This counts as 2 connections. A Command is sent and a receipt is requested. This counts as 2 connections. Is the Super SIM related to the Narrowband SIM? Not today. Today the Super SIM is designed to support 2G, 3G and LTE. Is Narrowband available on the same SIM we sell today? No. A separate physical SIM is required for Narrowband. How much data do I get per month during the Pilot? How many Commands can I send using Breakout SDK during the Pilot? There are no limit to the number of Commands that you can send and receive. How much do Commands cost during the Pilot? Commands delivered to Narrowband devices using the IP transport (not SMS) are free during the Pilot. Will my Narrowband SIM work with Programmable Voice? No. Narrowband IoT (the underlying radio technology) does not support voice. Will my Narrowband SIM work with Programmable SMS? No. Narrowband is not in any way designed for communications use cases. What type of hardware is required for a Narrowband SIM? See the Device Certification section for more information. Can I use any Narrowband cellular module device? No. Cellular modules must be certified by the T-Mobile network to be used in devices. Visit the Device Certification section for more information. Geographically, where can I use my Alfa Developer Board? T-Mobile's Narrowband network is deployed in the U.S. only. How can I order a SIGNAL 2018 Alfa Developer Kit? Alfa Developer Kit’s are not for sale in Console. Alfa Developer Kits were distributed to SIGNAL 2018 conference attendees in San Francisco, CA on October 17th & 18th. If you have a use case you'd like to prototype during the Pilot, please Talk to Sales. Developer Kits will be released for general sale at the conclusion of the Pilot. How can I order a Narrowband SIM? Narrowband SIMs are not currently available for order in Console during the Pilot. Talk to Sales. How do I create a Rate Plan for Narrowband SIMs? Can I use an existing Rate Plan with Narrowband SIMs? No. You must create a Rate Plan specifically designed for Narrowband. Any product utilizing the T-Mobile Narrowband network that is intended for commercialization will need to be certified by T-Mobile. Since the Alfa Developer Kit uses a T-Mobile certified module (the U-Blox N410B), most of the heavy lifting for certification has already been completed for you, assuming you continue to use the same module. As the OEM/Product Developer, you will need to provide T-Mobile with device capability information. Certification requirements include security certification, 'Safe For Network' testing, and delta certification for PTCRB. T-Mobile will also onboard the device to their Device Management platform, which today is handled for you by the Alfa Developer Kit.